Thousand reasons to discover the Vosges mountains! The Vosges is a unique region. It hosts preserved nature with particular flora and animal species… Not to mention its inhabitants who are generous and welcoming by nature, its cultural heritage and know-how. A great “four seasons” destination! The Vosges mountains invite the traveller to discover its great outdoors, to follow its themed or legendary routes, to visit its typical cities or to try your hand at its crafts. of waterways, 80 lakes, 1000 lakes, take the plunge! of walking paths including European 7 GR and 2 GR (GR 5 and GR 7). Unpack your walking shoes and trekking pole! The landscapes present a great natural diversity and surprising successions of colours and shapes. Water takes up the lion’s share. The plateau of the 1000 Lakes, shaped over thousands of years and the Malsaucy are perfect examples. The forests, the combes, the gorges compose rich and varied atmospheres, in particular the cherry trees in bloom, the symbol of Fougerolles, the land of Kirsch. An exceptional listed national site, located in the centre of the Regional Nature Park of the Ballons des Vosges, the Ballon d’Alsace is the highest point of the Southern Vosges with its 1247 m altitude. A remarkable architectural and cultural heritage further enhances this region dominated by nature. Nature and monuments are as one and create unusual landscapes. Belfort sheltered by the blue line of he Vosges, but also Luxeuil-les-Bains, nestled at the feet of the Vosges in the Saône region, and known since Antiquity for the benefits of its hot water springs. Or the Notre Dame du Haut Hill at Ronchamp with a panorama that stretches over the four horizons with extraordinary views of the Ballons des Vosges. Other testimonies of a rich heritage: the Route of the Abolishment of Slavery with the Maison de la négritude [Museum of Negritude] in Champagney. As to the Verrerie [glass factory] in La Rochère, the oldest active glass factory in France, it is listed as a living heritage company. At the heart of the Vosges Mountains, the mythical mountain passes have a special flavour. Known as a winter sports resort, La Planche des Belles Filles, has become a must for those who want to hit the slopes since the Tour de France 2012. 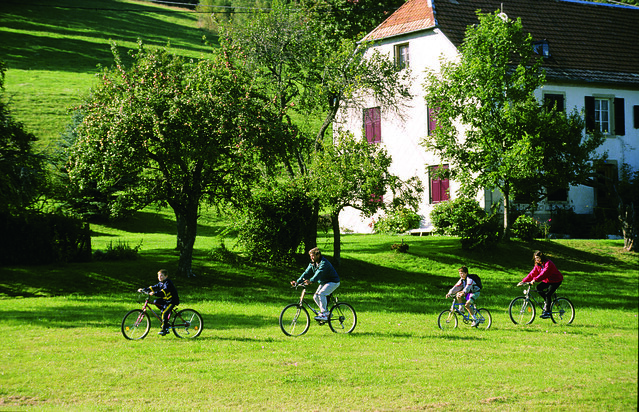 The Plateau of the 100 Lakes, with its moors, fields and forests crossed with brooks and water areas provides many ways to discover the region: trekking, mountain biking, horse riding, fishing, … An adventure circuit in the great outdoors, at the centre of the Ballon d’Alsace, the acropark proposes an initiation to mono cable cycling, the only one in France! A ride suspended in the air. After all those sports activities, relax with the Eurockéennes which have become an essential rendez-vous!